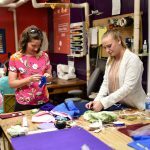 Makerspace Urbana and the United Way Emerging Community Leaders had a blast hosting the Fidget Blanket Workshop as part of the National Week of Making! Thank you to everyone who came out to help! 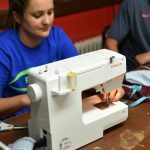 Makerspace Urbana hosted an educational workshop on June 6, 2016 to teach the skills necessary for others to make their own fidget blankets. Dementia is a general term for a decline in mental ability severe enough to interfere with daily life. There are many causes, including some that are reversible. Symptoms will vary, but at least two core mental functions must be impaired to be considered dementia: memory, communication/language, ability to focus, reasoning, judgment, visual perception. 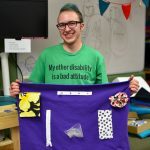 A fidget blanket is a small lap blanket that incorporates items for tactile and sensory stimulation for individuals with dementia or Alzheimer’s. Individuals with dementia often experience restlessness and having something to do with their hands can be calming. Base Fabric: Cut two pieces of fabric 20” x 24”. One will be the back of your blanket, set aside for later. The other will be the front of your blanket. The front is where you will attach the tactile elements. Make and collect the tactile elements you plan to attach the blanket. Add tactile elements to the front the blanket. Make sure each piece is securely attached, as they will be pulled on frequently. Some pieces (pockets, zippers, fabric swatches) can be attached by sewing machine. Others will require hand stitching (fabric flowers, pompoms). 3.Attach backing. Pin the backing fabric to the front with the tactile pieces already attached. Tactile elements should be on the inside as we will flip everything inside out after sewing. 4. Sew around the edge of the pinned front and back fabric, leaving a unsewn gap of about 3 inches. Use that unsewn gap to turn the blanket inside out, so the tactile elements are on the outside of the blanket. Sew the gap closed to complete the blanket. 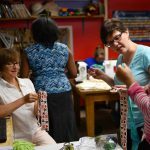 We encourage you to share these instructions with other sewing enthusiasts in our community and continue to make fidget blankets after the workshop. This is a continual need for many senior care facilities. The agencies listed have all expressed interest in receiving donated fidget blankets.